Having lived in Spain for the last eleven years, I kind of take a lot of things for granted, such as the joy of living in a hot country and getting to enjoy the most of outdoor life, almost every day. And because I have only and always been a wedding celebrant in Spain, I guess the one thing that I take for granted, is the fact that nearly all of my wedding ceremonies take place outside. I’m talking 99% of my weddings. And I can’t tell you how incredible that is to get to have these experiences, because I need to tell myself this, more often. When you have had something so good for so long, you can sometimes forget what’s so special about it. And there really is something so special and so magical about getting married outside, in the fresh air, amongst nature, that I really think it is something that needs paying a bit of attention to and looking at why, and for me on a personal vibe, to take a moment to appreciate how lucky I am to do what I do. Firstly, can I just say, if you are reading this and your ceremony is going to be taking place indoors, this is not a slight on your choice of ceremony location or on ceremonies that happen inside. What this is, is a look at the beauty of getting married outside and what it can bring to a wedding ceremony. The other day, I asked my celebrant colleagues in our Facebook group to share photos of their favourite ceremony spaces, and do you know what? Every single one of them posted photos of outdoor spaces. From the UK, to Australia, the USA and back to Europe, it was the au naturel spaces that ticked everyone’s boxes. So this got me thinking, why? Even if you are not a lover of the great outdoors, you don’t spend your weekends hiking or never sit on a patch of mud tending to your vegetables, you have to admit that just stepping outside and taking in a lungful of fresh air, really does do you the world of good. There are so many reasons why getting married outside takes ceremony magic to new levels. I don’t even think I can succinctly explain why it is, or how it happens, I just know it does. You cannot beat the beauty of natural surroundings. From cliffside locations, hills, mountains, beaches, gardens, courtyards, meadows and woodlands, the world around us offers the most stunning natural decoration that you could wish for. Who needs decor when you’ve got a lake as your backdrop, or a blue sky that frames your ceremony area or wise old trees that surround you and create a magical space? This beauty, this earthiness is unbeatable. And because of this natural, raw beauty something visceral is created during outdoor wedding ceremonies. Something really quite powerful, which you can’t quite put your finger on, but you can feel it and you know it’s there. 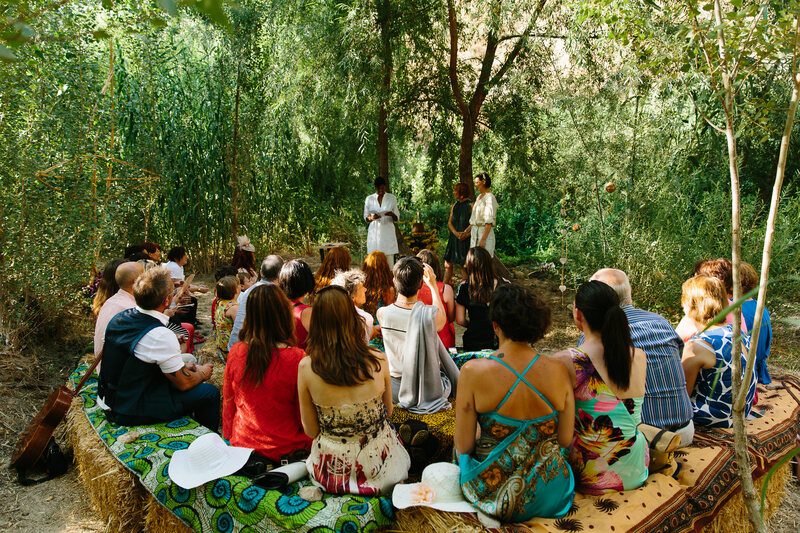 Something about your connection to the earth, to nature, to your family and friends, all comes together in a natural, harmonious environment, which really does make the ceremony so emotionally powerful and energized. Now, I may be sounding a bit hippy-fied, like I’ve swallowed a ton of love drugs, but I’m telling you, it’s true. I’ve been there, I’ve experienced it. Nature in all its full glory, is so present for you on your wedding day, bringing to life everything in contact with it. 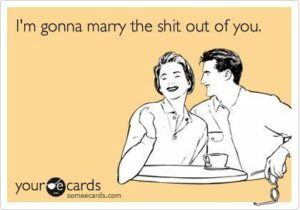 You, your wedding party and all your emotions. There is something very peaceful about being married outside, even when there is noise, or there are sounds. There is a lovely stillness and sense of tranquility, which really lends itself to getting married. Just being able to draw a huge breath of air, to calm the nerves, to ground yourself and to be still and present within the moment, is something you might not appreciate initially but you will probably find yourself doing so, without realising it. Being outside for your wedding day, really does promote a sense of freeness, as sense of freedom from restraints, which is all anyone wants to feel on their wedding day. No-one wants to feel stifled or claustrophobic, just the complete opposite. Freedom to be oneself, to love how one wishes, freedom to make one’s own choices, to celebrate one’s love in their own way, and nature really does help create this idea of freedom. I swear that this sense of open-ness can allow people (you and your guests) to open up more and to be less inhibited with their feelings and emotions during the ceremony. It can allow the group’s communal spirit and love flow more easily because the setting encourages this. And this can have such a wonderful impact on the ceremony. And even when nature does what nature wants, and maybe gives you rain when you rather it hadn’t or gives you too much sun when you wanted more shade, there is still so much to be joyful about and so much to appreciate, that later on, when you look back, any initial disappointment is soon forgotten. When you remember that you got to spend this special moment, with your loved ones, surrounded by their love and surrounded by earth’s beautiful gifts, you really will be so thankful and so grateful that you got to celebrate your love in such a meaningful and special way.